The publisher Hartsdale House was established in 1946 with Joseph M. Baruch as president, and Joseph Viertel as vice president. The firm published books referred to as the Hartsdale House Classics or Hartsdale House Editions in Publishers Weekly and advertisements from 1946, although these names don’t seem to have been used on the books themselves as series names. Most titles were published between 1946 and 1950 with a few reprints later. Hartsdale House titles were printed from the plates used to print the series of illustrated classics originally published by the Illustrated Editions Co., which ceased publication around 1942 when its founders, Joseph Meyers and his sister Edna Williams, established Avon Publications and the Avon Books paperbacks. World Publishing Co. of Cleveland, Ohio reprinted the Illustrated Editions series and sold them as the Illustrated Gift Editions from 1942 until at least 1946. 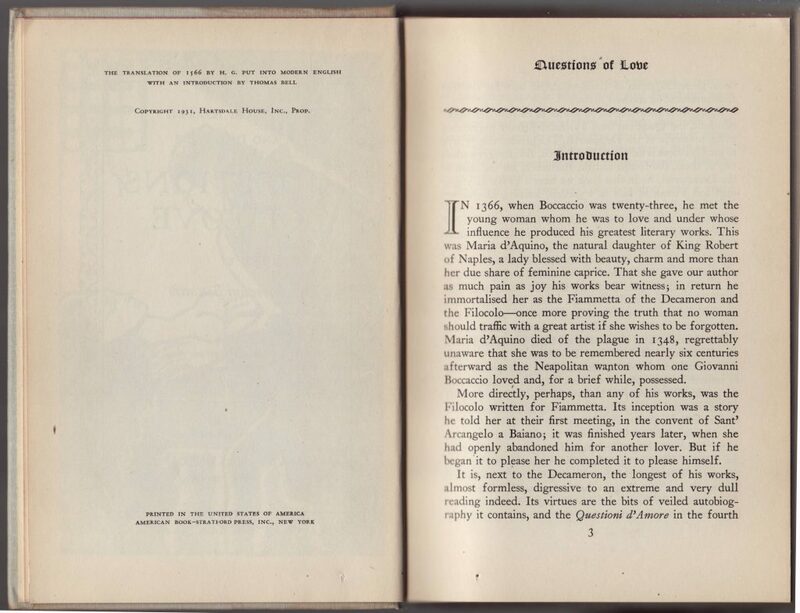 The initial Hartsdale House titles, from 1946 to 1948, cost $1.50 and were printed at the same size as the Illustrated Editions copies (6.5″ x 9.5″) but on thinner paper and a less substantial (but still decorated) binding. In 1948 the Retail Bookseller (vol. 51) announced that subsequent reprints would be smaller (5.5″ x 8.25″) and retail for $1. That same year it was announced that Garden City Publishing Co. (Doubleday) would distribute the books. Doubleday also printed the books and sold them under their Halcyon House Illustrated Library series in the early 1950s. 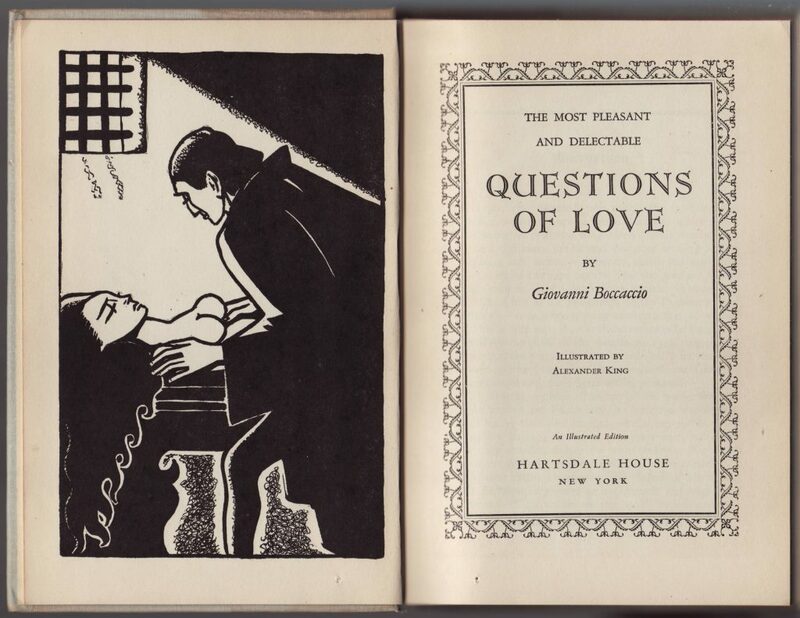 Hartsdale House titles are, then, 2nd generation reprints of illustrated reprints from the late 1930s. 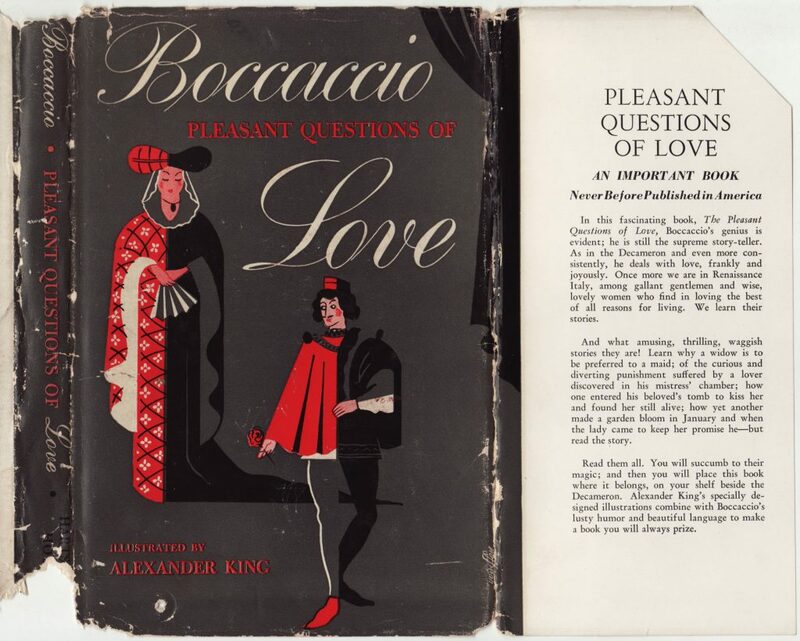 The dust jacket for Boccaccio’s Pleasant Questions of Love is unique to the title, as were other series jackets. 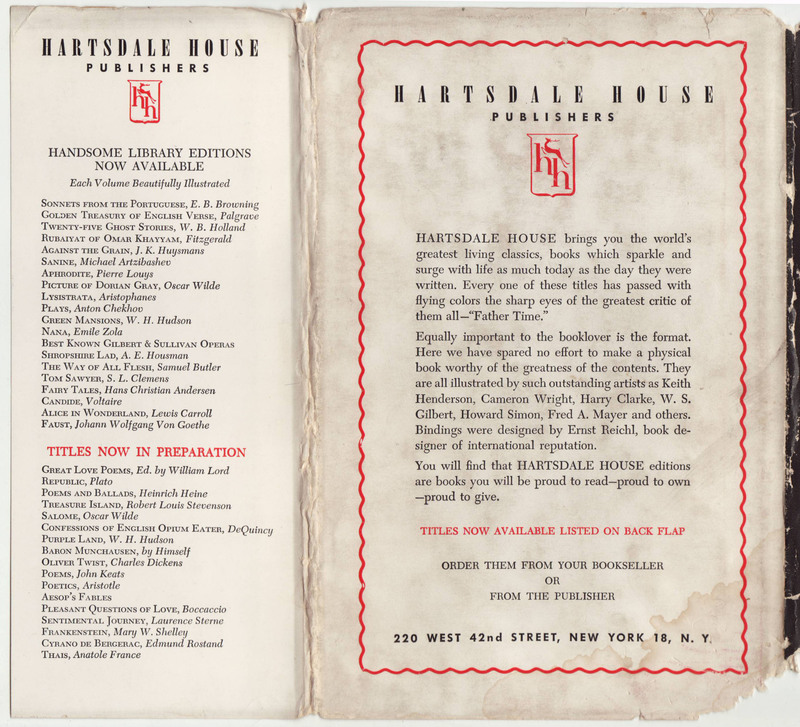 The jackets were newly designed for the Hartsdale House titles. The book’s illustrator, Alexander King, is noted on the front of the jacket. The book is blurbed on the front jacket flap. The text on the jacket flap is largely verbatim from the Illustrated Classics titles, including the “Never Before Published in America” statement, which, of course, is not true (as the books were printed in large numbers by Illustrated Editions, Inc. in the 1930s). The price on the jacket would have been $1, given the smaller size of this particular title. Hartsdale House, then, reprinted 39 titles total. Reprints appear until the late 1960s, but only infrequently after 1950. 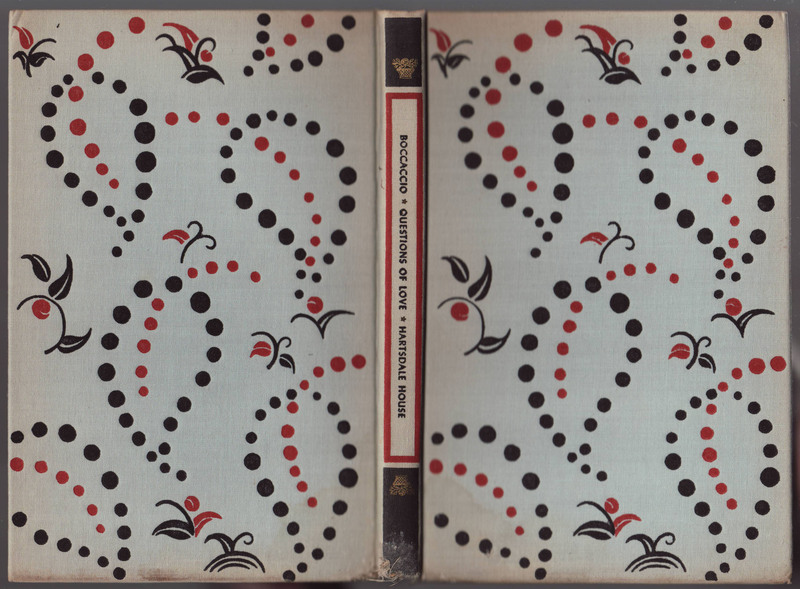 Bindings consist of a rather elaborate vegetation-themed design spread over the front and back of the book. The frontispiece and title page are the exact same as the Illustrated Editions copies, except for the Hartsdale House imprint. The copyright page remains the same except that Hartsdale House has replaced Illustrated Editions Co. for the 1931 copyright. The printer has changed from Little & Ives to American Book – Stratford Press (New York).